This is the first collection for the label under new designer Rodolfo Paglialunga. He is the third designer in two years, after Sophia Kokosalaki and Marc Audibet. Paglialunga created a resort collection that was dramatic and sensual with a hint of humor. It's definitely one of my favorites for resort. "Yeah, I farted in a Vionnet dress, JEALOUS? It's awesome even though it has a crazy figure skater bodice and an even crazier pirate wench bottom and I'm rockin' it with ONE LEG!" This is kinda weird and funky, right? I love the playful print on the sheer black fabric. Funnily seductive? Maybe. This is so fun! It's kind of formal at the top and bird-like at the bottom! I know the whole point of this is to be kind of a "naked dress", which I'm usually all for, but for some reason I want to see this layered over black tights and a leather bra. So.wicked. Crazy Botticelli Babe gown. WITH A HOOD! love love love. the fact that you just mad a saturday night live reference makes me like you even more. omg I friggin LOVE that first red dress! 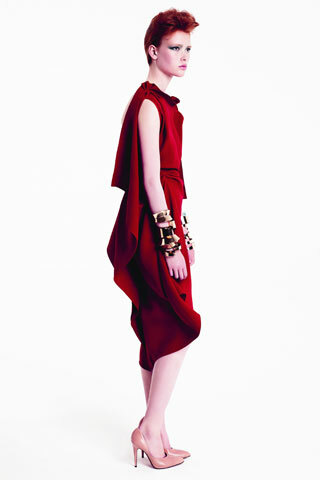 New Vionnet is off the hook! these are some stunning looks - the second is dead on, in the figure skater/pirate wench description, haha, but yes it totally works. stunning! and the naked dress would look all kinds of awesome with black tights and a leather bra. layering ftw. i want that hooded gown!!!!!!! wow. amazing. Your resort coverage is the best! I ADORE the purse in the 4th photo and the dress in the 3rd - fireworks!! I neeeeeeed it!!! That last gown is so me!